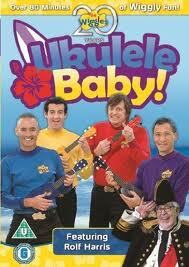 The Wiggles Ukulele Baby DVD is great viewing for kids. The Wiggles play a compilation of 21 songs within an island beach theme. The ukulele is one of the main instruments used. There is a lot of singing and dancing that all kids can join in. It certainly kept my young son dancing and singing, and dad had to join in too. Who’s in the DVD? All four wiggles, Murray Wiggle, Jeff Wiggle, Anthony Wiggle and Sam Wiggle. There’s also Captain Feathersword, I think he is cool! Dorothy the Dinosaur, Wag the Dog, Henry the Octopus and Ringo the Ring Master. Also featured are special guests Daryl Somers and Rolf Harris. Rolf plays his wobble board, this took me back to my childhood, watching Rolf on television listening to his Australian accent. There are musicians from around the world playing a variety of instruments. Note, there is no instruction on how to play the ukulele, and it isn’t played in every song. The main feature lasts nearly 60 minutes. The special features last for nearly 30 minutes, so all up nearly 90 minutes of viewing. This should keep youngsters who like the Wiggles engaged, allowing mums and dads the time to have a quick cup of tea and a biscuit. It’s rated ‘G’ or ‘U’ so it is suitable for anyone. Get it from your local library first, and if your kid(s) enjoy it expect to pay about $19 NZ for your own copy.